While there are a number of popular places to catch crab on Edisto, it can be done steps from your vacation home on front beach. 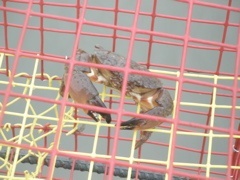 Crab pots are generally square and made out of wire with multiple points of entry for crabs. Bait is held in the center and when crabs enter the pot they cannot easily get back out. Crab pots can be purchased at the hardware store, Edistonian convenient store, or grocery store on Edisto. To catch crabs this way, the pot should be tied to a length of rope attached to a bobber. Empty gallon-sized milk jugs work great as they are easily identifiable and inexpensive. These alert beachgoers to the presence of the crab pot and mark their location (which could shift a few feet during the tides) for easy retrieving. Bring the crab pot out during low tide so that the water is calmer and it is easier to get the pot out deeper without it washing to shore.An adult would need to go out about chest deep to get the pot in sufficiently deep enough water. Leave the pot in the water for an entire tide cycle so that it can be retrieved again during low tide. Like catching crabs in the creek, females caught off the beach should also be thrown back. Cleaning and cooking methods are the same regardless of where the crabs were caught. *Note  proper precautions should be taken always when dealing with any form of crabbing or fishing in creeks and the ocean.